Beech trees thrive on Martha’s Vineyard. In fall and winter, they color the woods with bright gold leaves, which they keep until spring, when new leaves push off the old. 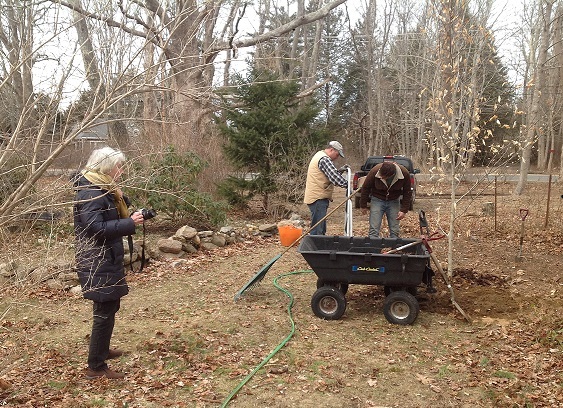 By early March, Howie and his son Mark were on their way East, along with vials of water and soil from the Pacific Coast to add to water from the Atlantic and earth from my garden to nourish our yet-to-be-found tree. Howie was driving a 1986 Toyota truck with camper body. From my Island, I envisioned my Knight in shining armor and his Squire Mark, overcoming obstacles along I-70 before he could cross the four-mile-wide moat to get to his Lady Love in the Cleaveland House. Groves of majestic beeches grew around ancient sites of power, where the trees provided easily split firewood and edible nuts and leaves. The leaves are said to be as sweet as mild cabbage but with a finer texture. In mediaeval times, tablets of thinly sliced beechwood were used before paper was introduced. In fact, Old English boc and Norse bok mean both beech and book. Even in modern German, Buch means book, Buche means beech. Westphalian ham is smoked with beechwood fires. Beech chips still are used in the brewing of German smoked beer. Drums made of beechwood are supposed to have a tone between maple- and birch-wood drums. Beechwood was often substituted for walnut for the stocks of rifles. Since we didn’t have a beech tree anywhere near our house, it became a matter of finding one. 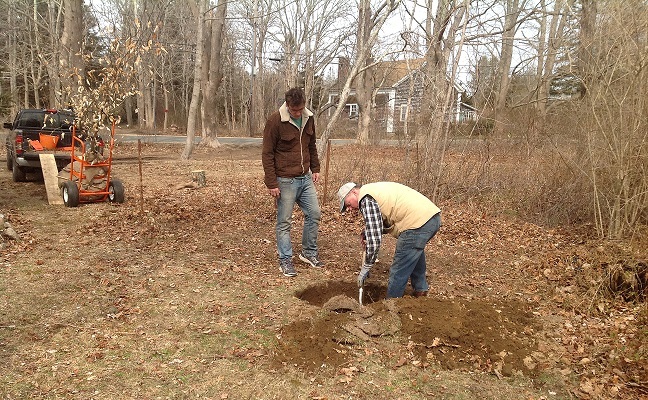 Howie and I figured we would be able to dig a small hole and plant a young tree, a foot or so tall, in it. 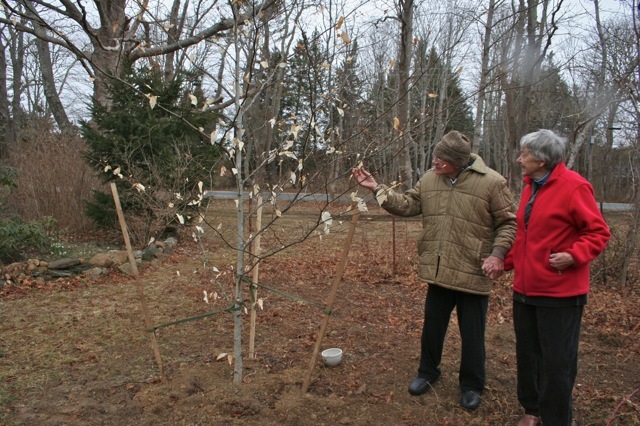 I asked Jonathan, a friend and neighbor who had beeches on his property, if we might have one of his trees. He scouted around and didn’t find one he thought would do. 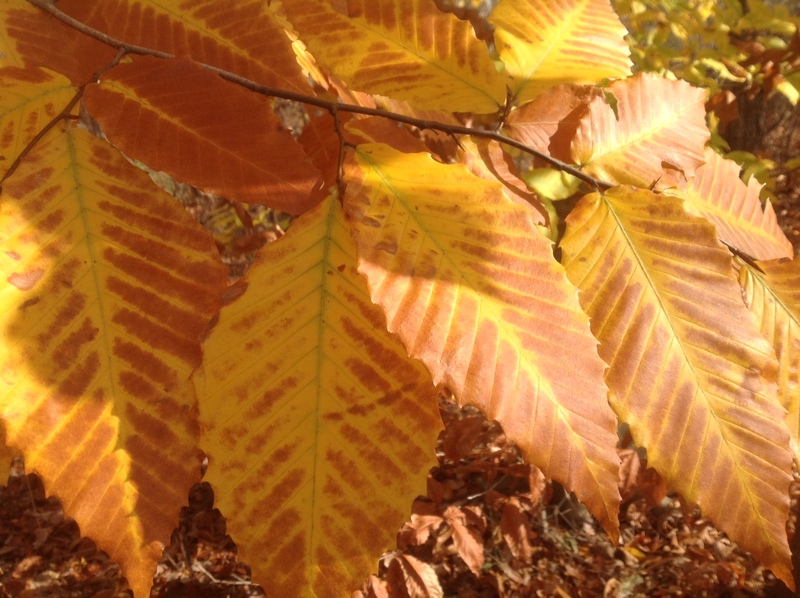 He knew we wanted a small, perfectly formed one, and he knew beeches are notoriously difficult to transplant. 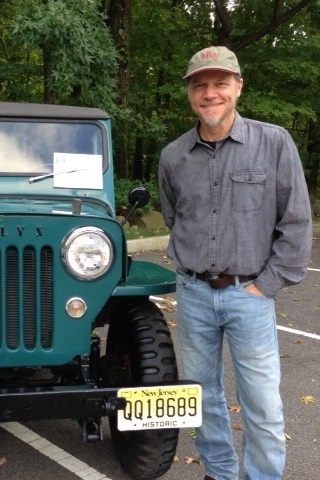 So he went to the director of the Polly Hill Arboretum, Tim Boland. Since Howie planned to arrive in late March, that would work. I dug a hole I thought would accommodate our foot-high tree when Tim brought it. The truck arrived, pulled off the Edgartown Road into our yard, and Tim and his six-foot-two son lifted the beech tree off the truck. It was twelve feet tall with a heavy root ball. He enlarged the hole to fit the tree and he and his son gently nudged it into its new home, packed sweet compost around its roots, and braced it with stakes against the north wind. Howie and Mark arrived, after confronting more obstacles than expected. The dragons of yore didn’t compare with cross-country snow and vehicle breakdowns. March on Martha’s Vineyard can be mild, but that year it was chilly, rainy, and raw. Cat performed our hand binding ceremony in front of the parlor fire. Mark and his family were present. 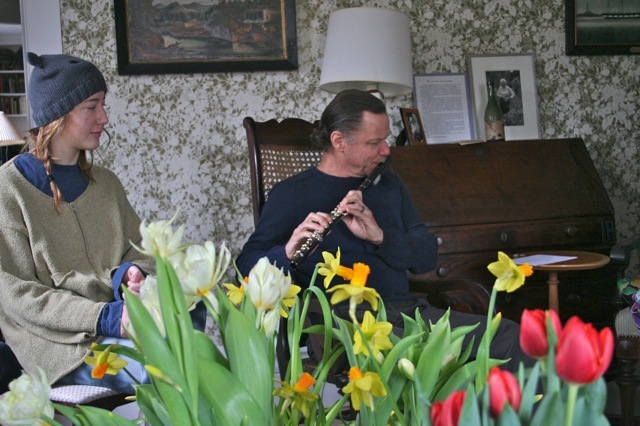 Mark, a musician, had composed a piece he played on his flute. The Wednesday writers attended. 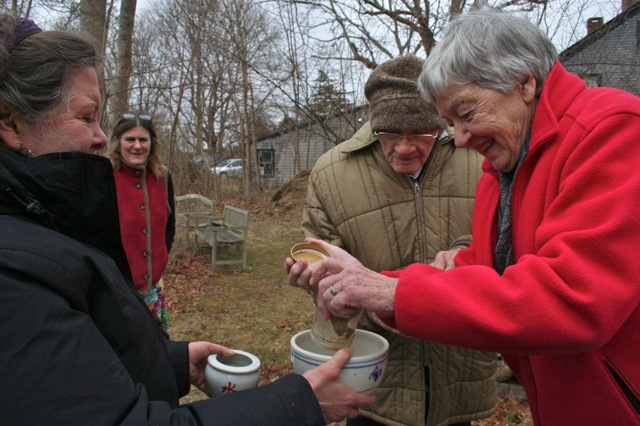 After the ceremony, we put on our foul weather gear and trudged out to our tree, poured the salt water from two oceans and soil from two gardens around it, and joined hands. It’s been almost two years since Tim planted the tree. It has grown from an adolescent twelve-foot-tall sapling to a real tree, almost twenty feet high. From the kitchen window we can watch it change through the seasons, from its bright green spring foliage to rich green summer, and bright gold in fall. 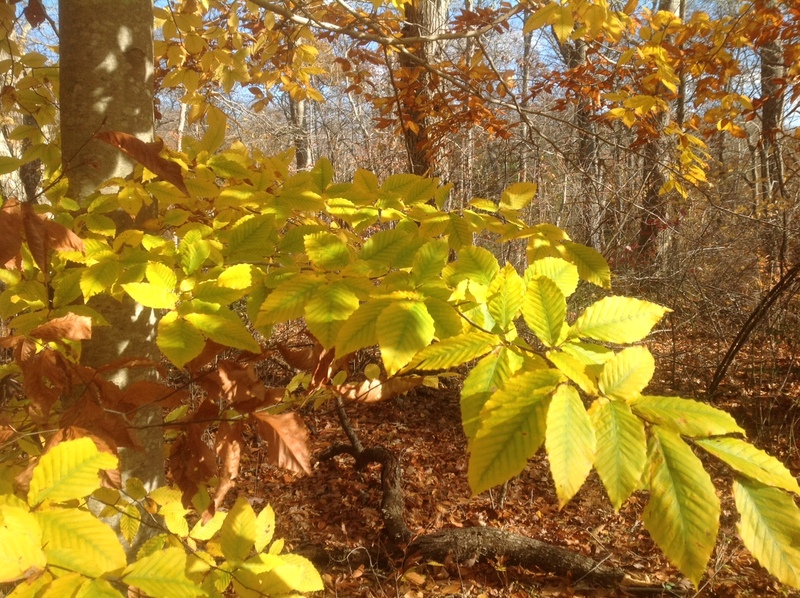 In winter, the gold leaves stand out among the gray trunks of oaks and maples. This past summer we watched from our swing as birds circled it, looking over the enticing branches as a possible nest site. Apparently salt water from two oceans did no harm. Helen of Troy was supposed to have carved her lover’s name on a beech. Jason used beech, not oak, when he built the Argo. Beeches have a long life, three hundred years or more. When we pass the huge copper beech in North Tisbury, near Middletown Nursery, we think that’s how our tree will look, some two hundred years from now. The beech tree we see from the kitchen and all it stands for is the legacy we will be leaving our grand- and great-grand and great-great grandchildren. and the chirping of birds. winter-bronzed leaves to the sky. It was my turn to make supper. Howie and I had finished a feast of corn pudding, spinach soufflé, mashed potatoes, biscuits, and tapioca. 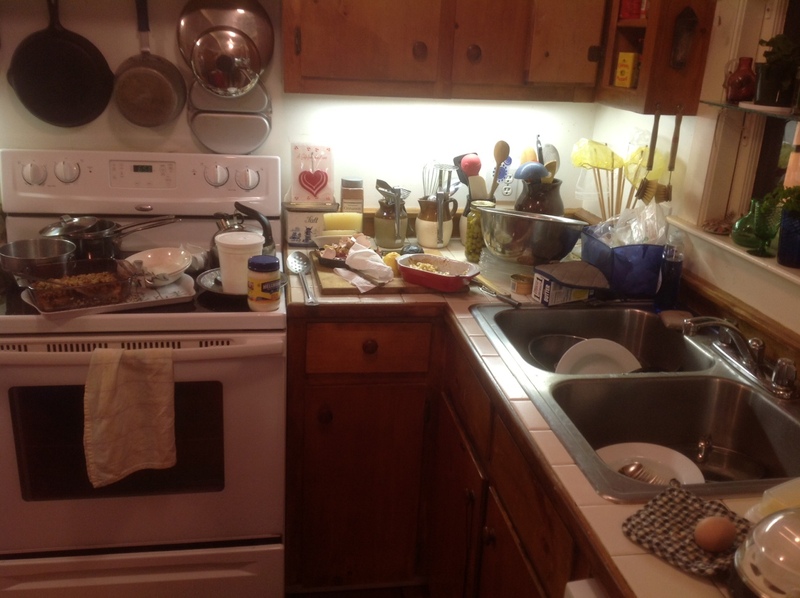 After we’d cleared the table, I gazed at the counters covered with dirty pots, pans, dishes, and utensils. Howie looked around at the counters, where there wasn’t room enough for another dirty glass. “You do use more dishes than I do,” he said quietly. My idea of preparing food is to lay out ingredients all over the kitchen to create something that suddenly pops into my mind. I’ll open the fridge and cabinets and pull out what might work in anticipation of some one-of-a-kind feast. Howie’s idea of dining is simplicity and efficiency. 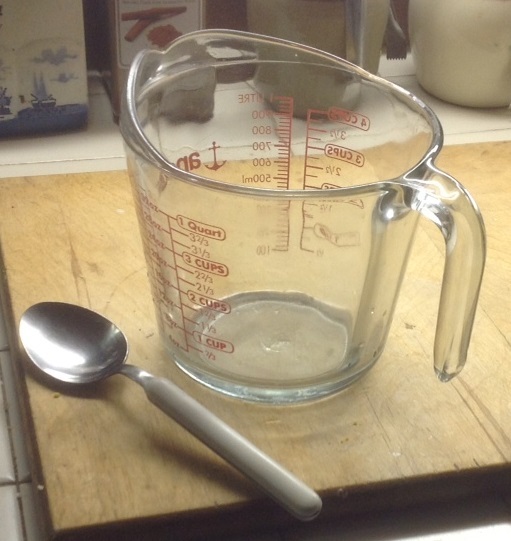 In his bachelor days he fine-tuned his meal-making into a one-quart glass measuring pitcher. He can concoct breakfast, lunch, and when it’s his turn to cook, an occasional dinner in that pitcher. He points out that, using his one pitcher, he can mix, microwave, eat, and clean up afterwards a great deal faster than I can. Howie has a point. Considering the problems we have with our dishwasher — the latest being a mouse-bite in a critical water-bearing pipe during the pre-Christmas family visit (see my post on Inanimate Objects) — hand washing one pitcher beats cleaning up my spread. In my favor, though, his quart pitcher could never have fed Duncan, our six-foot-five, 205-pound hockey playing grandson. In the No Words Necessary category, here are two photos of the kitchen, post-Cynthia (top), and post Howie (bottom). Here’s the report, in full up to date. We were about to fix lunch today. Rather, I was, because when it got to be 1:30 or so, your dad figured (erroneously) that I was involved in some important project and fixed his own. But he came out of his lab to keep me company, and that’s when I sprang it on him. Howie looked interested, the way he does. He waited. We were standing next to the stove and I was slathering two slices of bread with butter and mayonnaise preparatory to adding slices of chicken and onion. “It’s because Elizabeth Whelan, the painter, is coming over from Cuttyhunk on Monday to talk to you and make sketches of you for . . .” my voice trailed off. He was silent for several seconds. “Oh, c’mon,” he said, with a mixture of disbelief and apprehension. 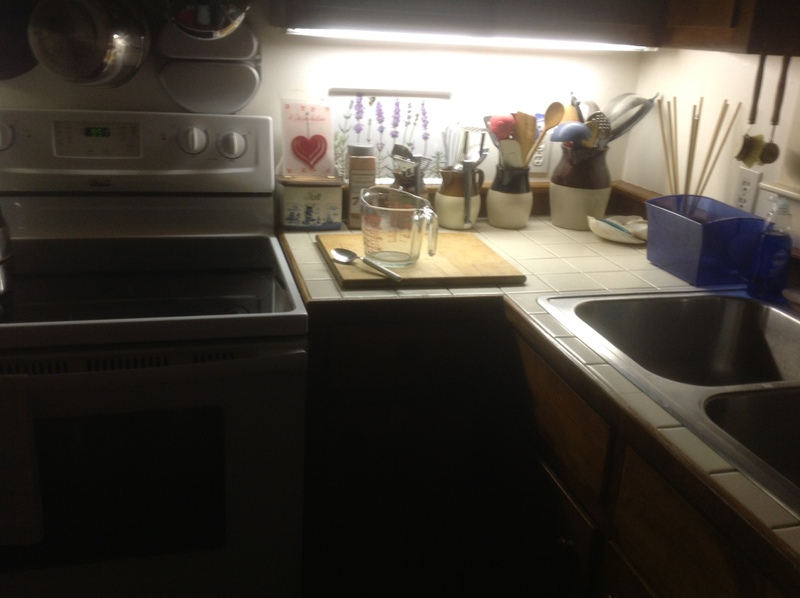 We went into the cookroom where I began to eat my potato chips and chicken and onion sandwich. Howie was watching the birds at the feeder. I looked over at him. He had closed the book and was holding a finger in it to mark the woodpecker page. “There’s that.” He moved his chair closer to mine and leaned toward me. “I’m eating onions,” I warned. “Yes.” And he kissed me. An hour later, we were on our way to the post office to get the mail. The colors this time of year are rich. Brown from the oaks, gold from the beeches, tawny and red from the wild grasses. A flock of turkeys pecked away at whatever delicacies they’d found in the field across from the arboretum. We savored the sights and smells and the good feeling of being alive to appreciate it all. We drove in silence. Contented. 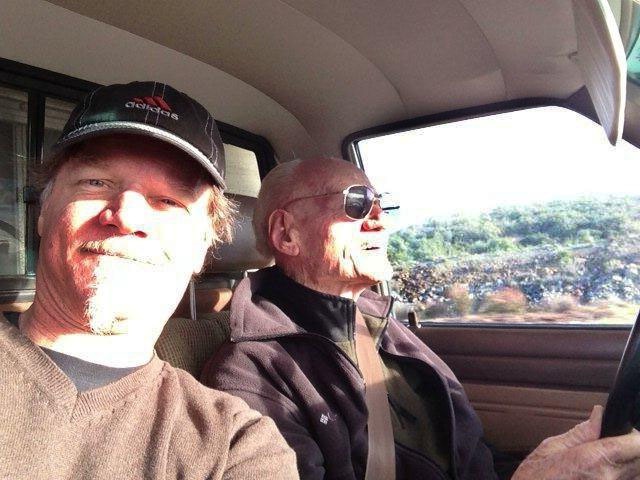 Howie drives like a teenager — left hand on the wheel, right hand holding mine. I didn’t say anything because Elizabeth and I had already agreed on a painting two feet by almost three feet. He added something about being afraid he’d give her painters’ block because he was so blank — that was his word. This is the man his granddaughter calls “The King of Romance.” The man interviewed by CBS News, talked about on The Moth Radio, who was featured on the Huffington Post’s New Year’s Eve program, was approached by the Hallmark Hall of Fame and a major ad agency doing a Valentine’s Day special for a chocolate company, who got an e-mail from “O’s” beauty editor, was featured in an article that appeared above the fold on the front page of the Boston Globe with a photo of the two of us, was interviewed by Fox News, and on and on. I don’t think there’s a soul on Martha’s Vineyard who doesn’t know him to speak to. 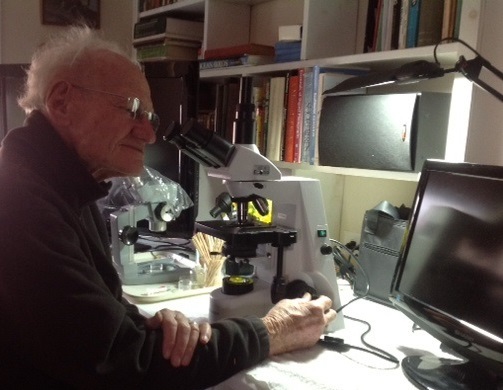 He’s done enough community, scientific, photographic, and artistic work in his long and productive life so he doesn’t need to go down in history for his romanticism. Though come to think of it, that’s not a bad legacy to leave. So Elizabeth will be coming by boat from Cuttyhunk to the Vineyard on Monday to start the process of painting Howie’s portrait. I’ll keep you informed about developments. A B&B guest who planned on coming to the Vineyard for the first time for a memorial service phoned and asked me what the Island’s dress code was for such an occasion. “Yes, but you might try the dump first,” I said. “Since the dump is on the way into town, check it out,” I suggested, and drew him a sketch map showing how to get there. I have great faith in our dump’s recycling area, which is known as the “Dumptique.” Some years back, friends of my sister and brother-in-law planned a trip to England on the QE II. They found, at the dump, the attire they needed for the cruise — a tuxedo that fit him, two cocktail dresses she liked (and that fit her). They wore them on the ship and when they arrived in London, left their newly acquired clothes at Oxfam, since they planned to fly home. Another friend found her wedding gown, brand new, at the Dumptique. According to the dumpmaster, the disgruntled bride-to-be left the gown with words to the effect of: that was where the erstwhile groom belonged. The other day Howie was looking for a nice warm coat for his step daughter, Susan, to wear during her visit from sunny San Diego. 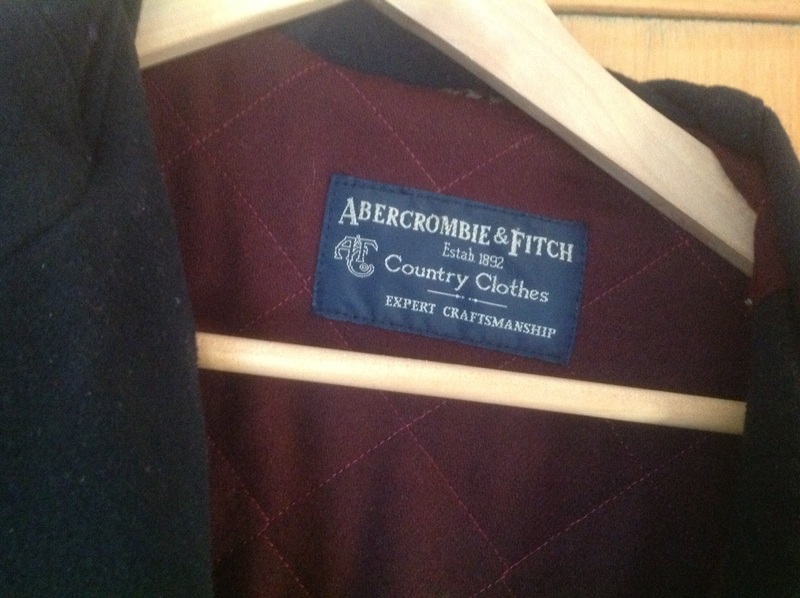 An all wool, almost new, Abercrombie and Fitch winter coat in Susan’s size was hanging on the rack right in front of him in the Dumptique. People new to us Islanders’ love of dump-picking don’t understand. Martha’s Vineyard is one of the most severely depressed counties in the Commonwealth of Massachusetts, with one of the lowest per capita incomes. Yet our Island is also the playground of the rich and famous, who come here with their designer outfits, and at the end of the season leave their outdated garments behind. Often at the dump. Shirts, suits, shoes, hats, saddles, sweaters, toys. Top of the line. Dishes, books. 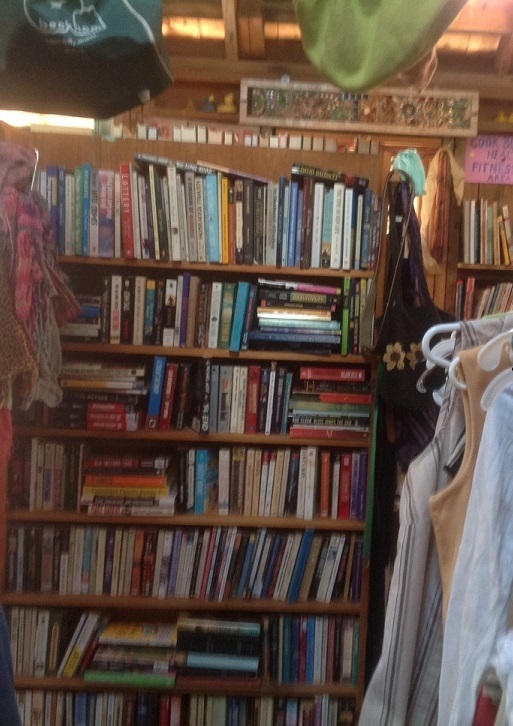 Speaking of books, a visitor from Vienna, Austria, intrigued by the idea of a department store with free-for-the-taking items, was browsing through the Dumptique’s bookshelves. 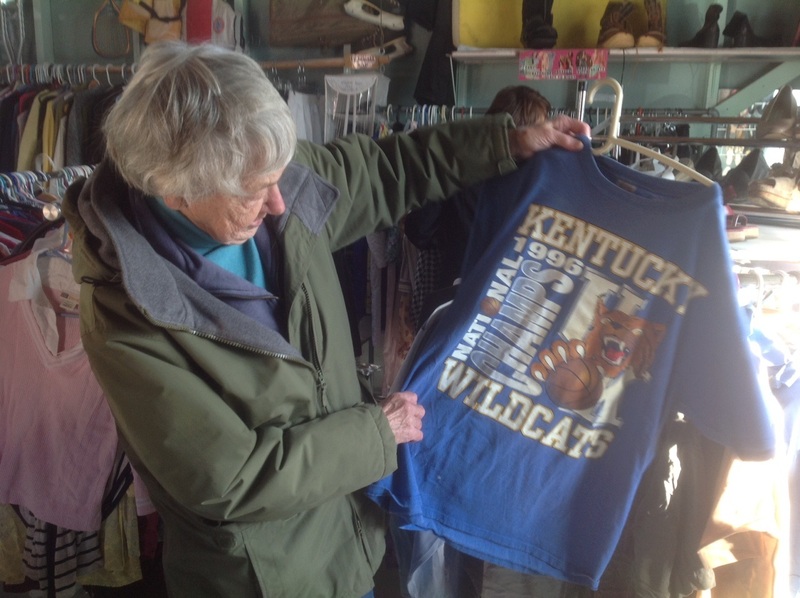 I was checking out the sweatshirt rack when I heard her scream — quite literally. I rehung the shirt I’d been about to take and dashed over to the book shelves. Eleonore was holding a book tightly against her breast and was gazing skyward. “All right? !” She had trouble gasping out the words. “I’ve been searching for this book. Vienna. London. Paris. New York. And I come to your West Tisbury dump. . . “ Her voice trailed off. The book was one she’d wanted for her PhD dissertation. The story hit the Martha’s Vineyard Times. The dump is where we pass out flyers promoting our cherished causes. It’s where we go for signatures on petitions, and where we get neighbors to sign the papers we need when we run for town office. One year I made a floral arrangement for the Garden Club for the County Fair. The arrangement was called “From the Dump,” and featured goldenrod. Queen Anne’s Lace, chicory, and I don’t recall what else, all displayed in a large and elegant vase, and all from the dump. It won second prize. Before our rubbish was hauled off-Island, we used to dump our trash into a large pit. Items too good to be tossed so cavalierly in with garbage would be placed carefully on the side of the pit. One year I found a dozen almost new feather pillows laid out in the sun on top of a clean sheet. The owner apparently had developed an allergy to feathers. I gathered them up and we still have them. Everett, who’s in the Sunday Writers group, said he knows of a family that makes a practice of exchanging Christmas presents strictly from the dump. Within the last few months, with little fanfare, the graded-over area where we used to toss our rubbish has become a field of solar panels, hundreds of them lined up to take advantage of the free energy beaming down to us. Howie has a shopping list he takes with him for our dump runs. On it are such items as winter boots, size 13; wool watch cap (he crossed that off when he found one); winter coat (crossed off); knife sharpener; chicken-coop light; binoculars; seat cushions (also crossed off). 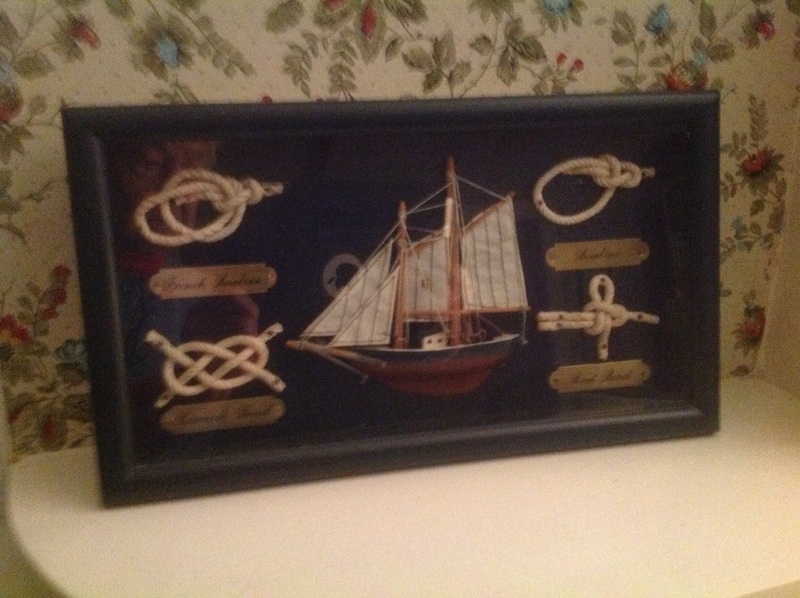 Knowing my love of boats, he found, at the dump, a beautifully framed knot board. On it are a bowline, a sheet bend, a Carrick bend, and a French bowline, and in the middle is a half-model of a gaff-rigged schooner. He cleaned the glass, oiled the frame, and it hangs in my study. The building that houses the Dumptique was built by carpenters, who volunteered time and material. 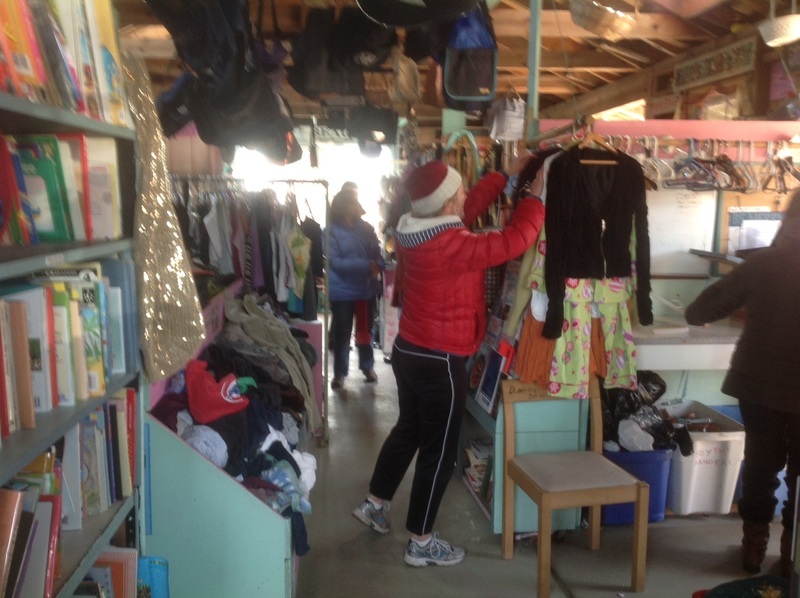 Volunteers run the Dumptique, spring, summer, fall, and winter, when the weather is mild enough, since there’s no heat in the building. 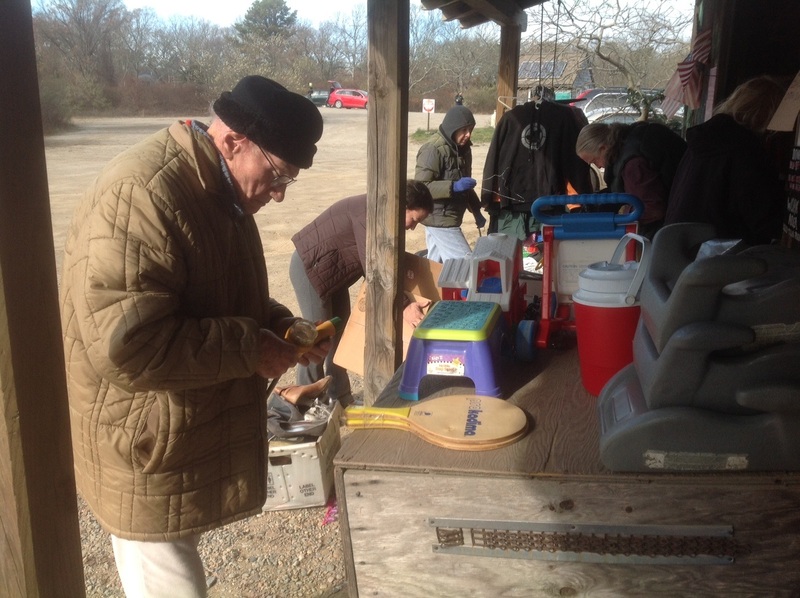 The volunteers accept scads of stuff people don’t want that’s too good to throw out. 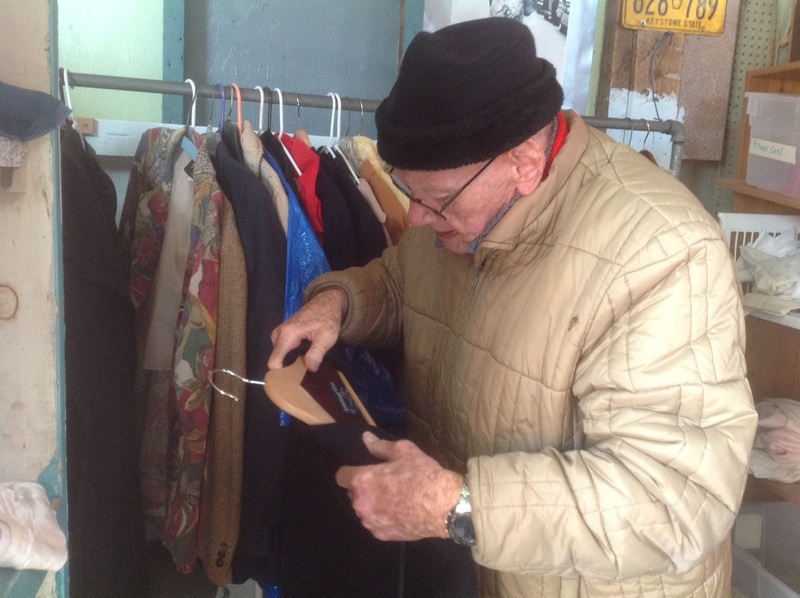 They sort the coats and slacks and dresses and sweaters and hang them neatly on racks. 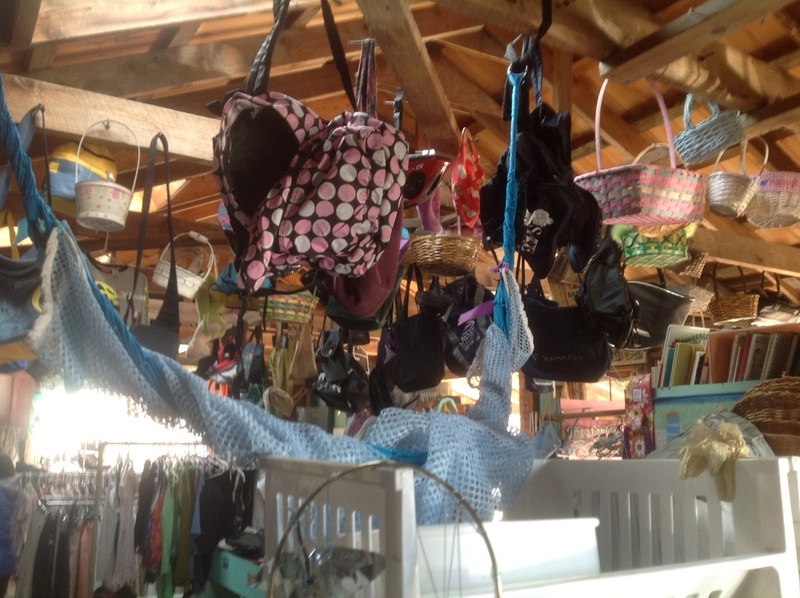 They stack the china, organize the toys and children’s clothing, go through the books and shelve them, and, out in front, they display the unwanted bicycles, tricycles, wheelbarrows, and things too large to bring inside. There’s usually an artist among the volunteers. One year the outer wall was hung with a half-dozen discarded crutches, artistically arranged and entwined with discarded artificial ivy. Back to our B&B guest. He returned an hour later wearing an almost new sports coat that fit as though it was custom made for him. 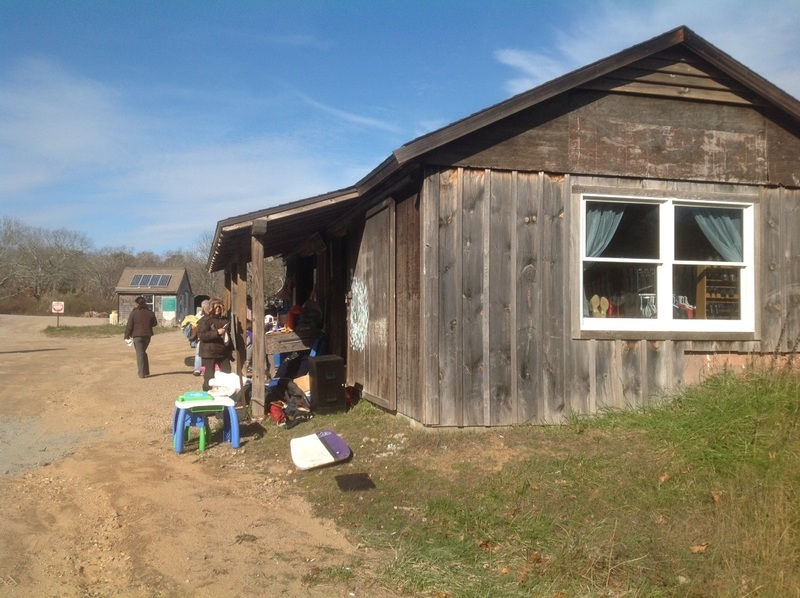 We who live in West Tisbury love our dump. It was, quite literally, a dark and stormy night, when MURDER ON C-DOCK, my latest mystery, was conceived. At the time I wrote it, I was living on a houseboat in Washington, D.C., only a short walk from the Smithsonian’s Natural History Museum, where I worked. Living on a houseboat had been a childhood fantasy of mine, so after my divorce, I bought a 44-foot houseboat and lived aboard for the following twelve years. “What’s it like in the winter?” was one of the most common questions we liveaboards were asked. But our boats were well insulated and warm, and on dark and stormy nights, dock people would gather on a neighbor’s boat with a jug or two of wine and talk river talk. This particular night I recall clearly. It was February. The wind was whipping up whitecaps in the normally sheltered Washington Channel, where the Capital Yacht Club’s three docks, A, B, and C, were located. Boats strained against their lines, swaying and surging and rocking as the lines tightened and loosened. Each of the three docks was a floating dock with giant steel rings that moved up and down steel pilings as the water level rose and fell. Our boats were always level with the docks. That night the steel rings clanged loudly against the pilings as the channel’s waves beat against the floating docks. It was snowing. Wind-blown sleet and spray rattled against the portholes and windshields. I made my way slowly along the icy dock to my neighbor Evie’s boat, placing my feet with care so I wouldn’t slip. Light from her houseboat reflected off the ice on the dock. As I got close, I could hear voices of our neighbors, Sam and his wife, Marilyn, who lived aboard the big Connie on B-Dock. “Permission to board?” The usual polite greeting. I timed my step from the dock onto the deck of Evie’s boat, Tender Trap, to make sure her boat had moved as close to the dock as the lines would allow, grasped the boat’s hand railing with the free hand that wasn’t holding the wine jug, and stepped aboard and into the warm, crowded saloon of her houseboat. “Hell of a night,” said Sam, a short, stocky man with a waxed mustache that stuck out at least three inches on each side. There were four others there besides Sam and Marilyn, Evie and me. Someone laughed. “Don’t remind me,” I said. “At least you’re not alone,” said Marilyn. I handed the jug to Evie, who set it on the counter. She liked experimenting with her hair color, and tonight it was a glittery, metallic red. Evie had a high pitched giggle. “We could murder him,” she said, along with her giggle. She was trying to work off the jug’s cap. Sam got unsteadily to his feet as a gust of wind hammered the side of Tender Trap. “Let me get that.” With a masterful twist, the cap was off. “There you go.” He handed the jug back to Evie and turned to me. “You could do it. No one would finger you.” He twirled the ends of his mustache like the villain in an old movie. The boat swayed and we swayed with it. “Great idea,” said Henry, who was sitting on the settee next to the console. “Sam, you’re a writer.” Henry, a tall, dignified black guy with white hair and a white mustache, taught economic theory at Howard University. “Not me.” Sam shook his head. “Yes!” A chorus from all. “You wrote that article on Captain Kitty,” said Rob, who was sitting next to Henry. Captain Kitty was Evie’s boat cat. “It wasn’t bad.” Rob worked in one of the super-secret spy agencies on the other side of the river that no one was supposed to know about. We all knew he worked there. He explained to me once, in the hushed tone of voice he liked to use, how he could kill someone by filling the proposed victim’s cigarette with the non-stick lining scraped out of a frying pan. “Write about the fire,” said Marilyn, running her fingers through her hair. One of the boats on C-Dock had caught fire about six weeks earlier, and collectively, we still shuddered at the close call. The D.C. fireboat and what seemed like the whole metropolitan fire department responded. The entire dock, with its boats, their gasoline tanks, and everyone nearby, could have gone up in flames. Ron, who’d been aboard, had narrowly escaped. “Definitely the way to start the book,” said Bud. So that’s how it started. I got dragooned into it. I didn’t think I could turn out a book. Writing a book seemed a colossal task, like knitting a sweater or worse. But the pages piled up and the story evolved and I put in all the dock people I loved and the ones I didn’t love and killed off the ones I hated, including the commodore. Like most first books, it was unpublishable. I did get an agent, but she couldn’t sell it. I revised it and revised it and revised it again. The breakthrough came through the Wednesday Writers, the ones who got me together with Howie, the Love of My Life. “You need to . . .” “Cut the part where. . .” “The characters aren’t distinct enough. . .” “Why not . . .” On and on, one Wednesday meeting after another. I did as they said, and revised some more. I had never been comfortable with my original protagonist. For some reason, I didn’t understand her or her way of thinking. I didn’t feel as though I had enough respect for her. One Wednesday evening as I listened to suggestions from Lisa, light dawned. I would base Persie Lee Butler, my main character, on her. I love Lisa. She’s got a daughter who will figure prominently in future books. Lisa is a marathon runner. I can have her run through some of Washington’s beautiful scenery. For 12 years, Cynthia Riggs lived in a houseboat on the Washington, D.C., waterfront — and she’s put her nautical experience to nefarious use in her forthcoming mystery, Murder on C-Dock. When Commodore Dunn is murdered, there’s no shortage of suspects: everyone on C-Dock had reason to wish him dead. Persie Lee Butler’s sleuthing soon turns up a web of secrets that goes back 30 years — and puts her own life in danger. 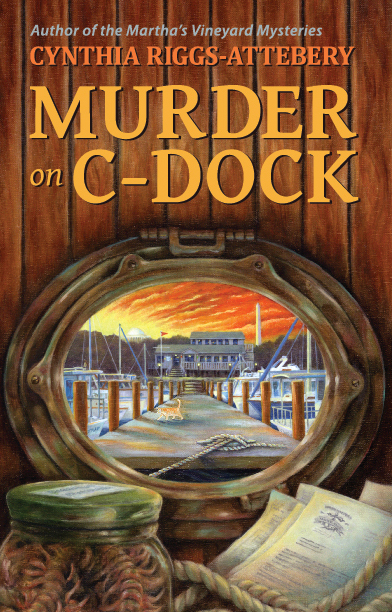 Murder on C-Dock features a stunning cover by Martha’s Vineyard artist Elizabeth R. Whelan, a sailor herself who knows her boats. 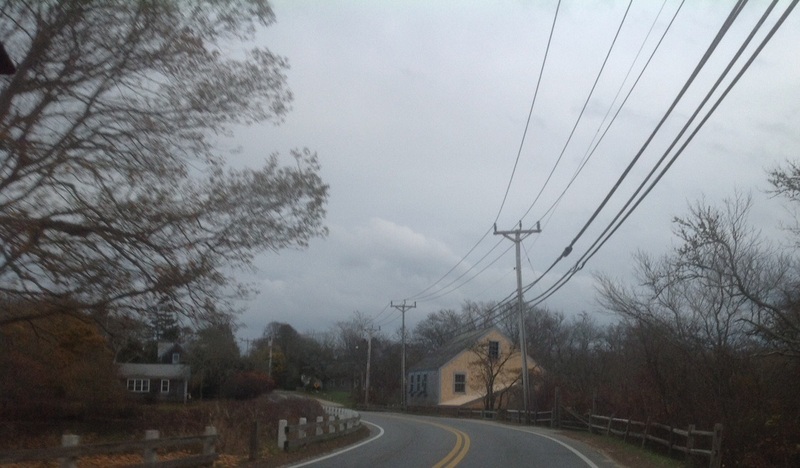 When Howie and I win the Massachusetts Lottery’s Mega-Millions (currently $35 million), we have agreed on how we’re going to spend it: Put those ugly overhead electric/telephone wires underground. We’re tired of the electricity cutting off in the midst of writing, cooking, or about to identify some creature with the microscope. Most of all, we’re tired of looking at the butchery of trees that are far older than the electric/telephone companies. 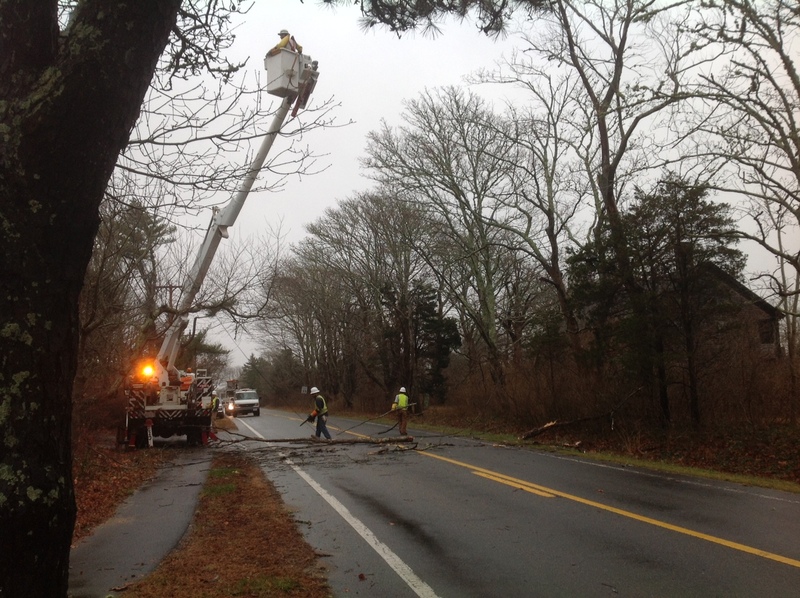 We plan to start burying the wires in West Tisbury and continue throughout the Island until we run out of our gambling gains. leaving no place for orioles. where the sparrow hawk lived. and threaded the trees on wires. a necklace of misshapen trees? 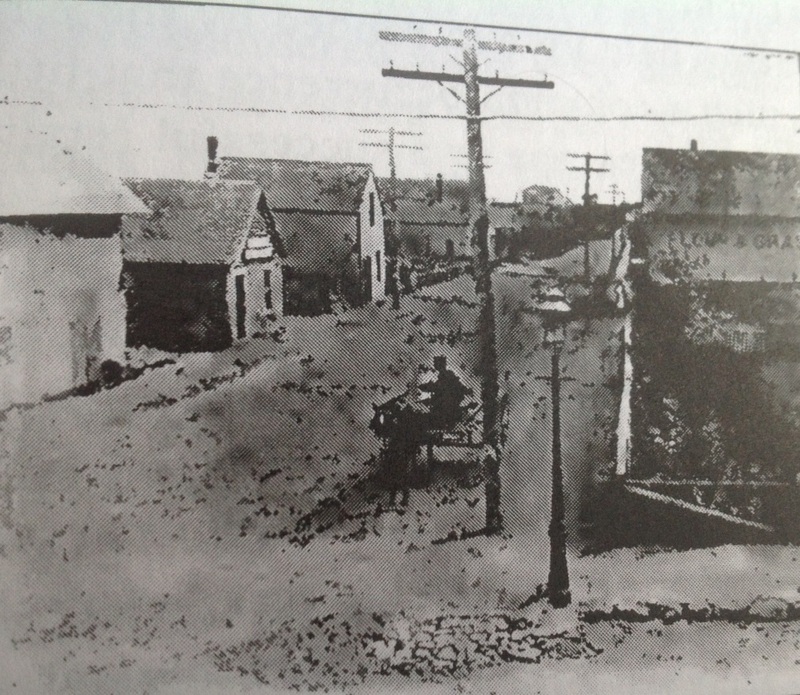 This morning I was thumbing through pages of a 1908 book called, “The Story of Martha’s Vineyard” by Charles Gilbert Hine, trying to find a quote about overhead wires I’d remembered reading. Howie and I were sitting together on the side of the big bed that John Thayer’s son Nate made for us. Howie was writing a letter on his iPad and set it down in his lap to listen to me. “I know it’s here somewhere,” I mumbled, flipping through more pages. An item caught my attention. “Listen to this.” I’d stopped at a poem someone had written about his grandmother, who, during the Revolutionary War, had fought off a Red Coat who was about to take her cow. She was so angry, she later took the lead weights out of her grandfather clock and had bullets made from them. “Interesting,” said Howie , touching the screen to save his letter. I flipped more pages. “And listen to this,” I said, reading him a story about pirates burying gold at Wasque. (Pronounced WAY-squee). “Umm,” said Howie. He turned back to his letter. The writer would like to express his disapproval of the telegraph-telephone-trolley poles and wires that line so many public highways to the serious detriment of their beauty; the generation is probably not far off that will wonder why such disfigurements were allowed. 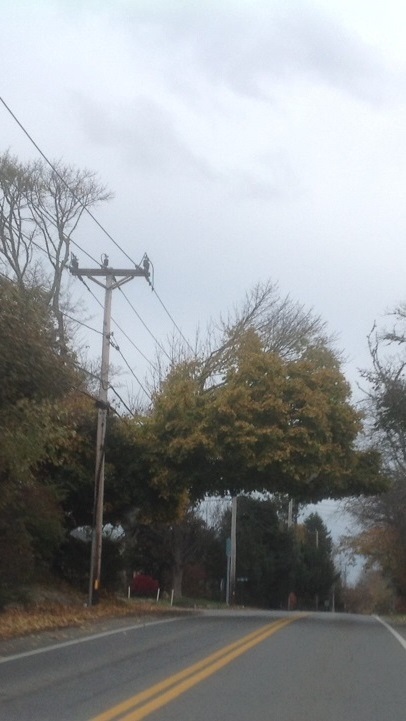 Last Thanksgiving, wind whipped off a branch from a tree across the Edgartown Road from us. The branch tore down the wires that brought electricity into our house. On the stove, cooking, were the Thanksgiving turkey, cranberry sauce, soon-to-be-mashed potatoes, sweet potato casserole, green beans, pumpkin pie . . .
We don’t always mind when the electricity goes off. Candles are lined up on top of the piano where we can find them in the dark, the fire in the parlor fireplace is laid, ready to light. Until 1950, we didn’t even have electricity in the house, and when it goes off, the house is quiet, the way I remember it as a child. We don’t realize how much noise our appliances generate until the electricity is cut off. When it fails, it’s often night. Wind, rain, snow, ice, or someone driving into a telephone pole will do it. On a clear night, Howie and I bundle up in our warm jackets, pull on our wooly caps and gloves, and go outside to look at the stars. It’s then that we don’t mind those vulnerable overhead wires. However, Howie buys three or four lottery slips at Conroy’s Apothecary every week. 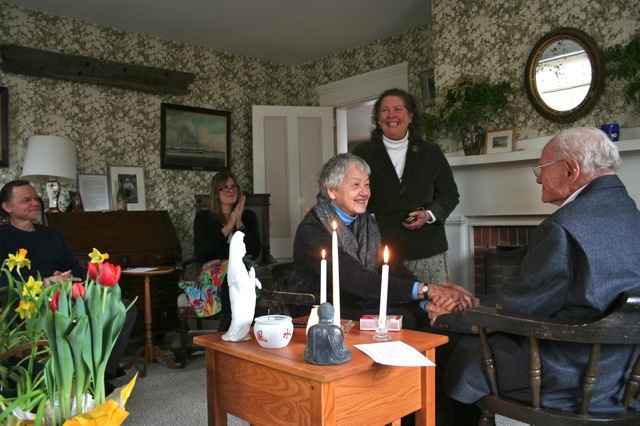 When Victoria Trumbull, my 92-year-old poet sleuth, writes her weekly column for the Island Enquirer and needs just the right word, she occasionally glances up from her typewriter at the white-steepled Congregational church in the distant village center. For three centuries, villagers have looked to the church for guidance, whether spiritual, to see by the weathervane which way the wind blows, to check the time on the town clock, or to find an inspired word. The church has always been such an important part of village life, it naturally figures in village death as well. A perfect setting for a mystery. But clergymen don’t get involved in murder. Do they? 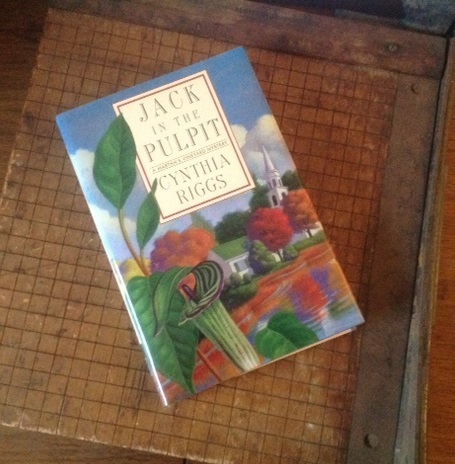 At one time, my real life Congregational church had a real minister called “Jack.” Why not a mystery about feuding ministers, both called “Jack,” and, since my titles include plant names, call it Jack in the Pulpit? For days I puzzled over the situation. What could possibly arouse murderous feelings in the souls of two clergymen? I finally decided I had to simply write, and stop playing computer solitaire. Since I don’t plot, I figured the story would work itself out eventually, and I’d learn as I went along what motivated my two Jacks. And sure enough, the story unfolded. The Reverend John (Jack) Hutchinson and his wife Maddy decide to retire after twenty years, and they turn their church over to the Reverend Milton (Jack) Jackson and his wife Betty, along with generous offers of help. The new Reverend Jack and his wife Betty resent the help, which they see as interference. Of course, all hell breaks loose. One elderly parishioner after another drops dead. All but one have left handsome beneficences to the church. Villagers take sides. Victoria, loyal to the old Reverend Jack, is convinced that the new Reverend Jack is killing off his parishioners. That’s how the story begins. 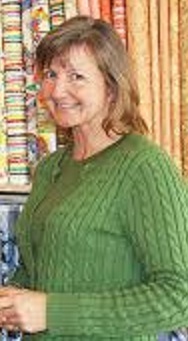 Victoria was still driving a car in Chapter One, but she loses her license after backing into the Meals on Wheels van. Her granddaughter Elizabeth is stalked by her ex-husband. Mushroom quiches, stuffed bluefish, chicken soup fly back and forth, appearing and disappearing on neighbors’ kitchen tables, the way food does in real life on our Island. At precisely fifteen minutes before ten o’clock every Sunday morning, the church sexton climbs the steps partway to the choir loft and pulls the bell rope. Before the bell begins to sound, the rope rises with a rumble through a smoothed hole in the flooring of the choir loft, rubbing off a dusting of wood as it has for three centuries. 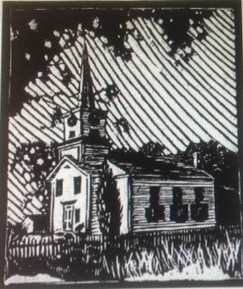 Then the bell swings in the steeple and starts to peal. The bright sound carries all the way to Victoria’s house and beyond. Time enough for her to get her hat on, settle in her regular pew, and listen to the sermon by Jack. In the pulpit, natch. This morning Howie said to me, “You left out the refrigerator in your post about inanimate objects. I think you hurt its feelings. 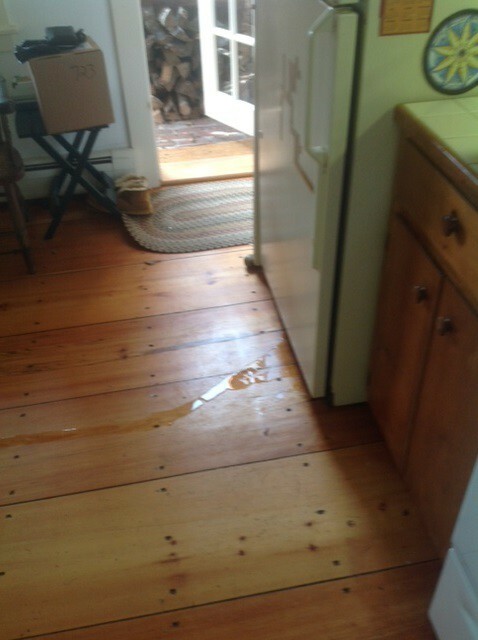 It’s weeping.” He led me into the kitchen where the refrigerator had drizzled a stream of water onto the floor. I apologize to the refrigerator. You’ve been the one inanimate object in my life that’s given me absolutely no problem ever since we acquired you more than twenty-five years ago. DO INANIMATE OBJECTS HAVE FEELINGS? Apparently they do have feelings. At least that’s the impression I got when I did what he suggested. The screen popped up with more than a million results in a third of a second, and the first screen was focused on the belief that inanimate objects have feelings. The stove predates him by two years. I have suspected, ever since he came back into my life, that I would not be having problems with the feelings of the inanimate objects that surround me had he been around to pacify them when they arrived. He has the patience of Job, the serenity of Buddha, and, like Saint Francis of Assisi, an ability to communicate with non-humans. Including inanimate objects. The stove, for example, refuses to provide cooking heat the way I want it to. 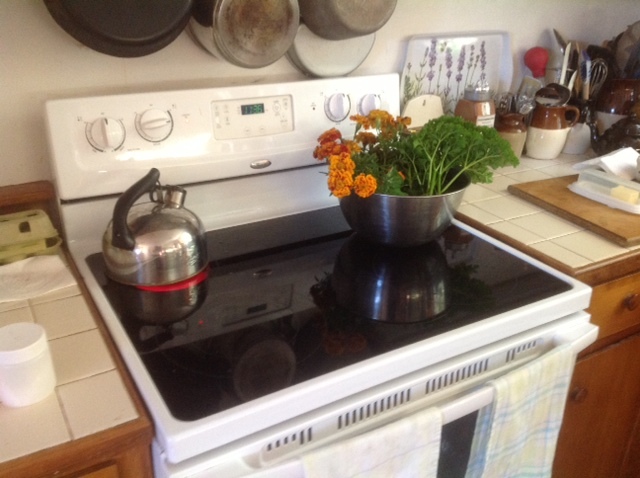 I bought it because of the top, a wonderful, shiny, glass surface that would look nice, be easy to clean, and, when not heated up, I could use as a flat surface on which to put things. And to this day, I love the top of the stove. But that’s it. The stove apparently believes that HOT and NOT HOT can be averaged out to provide a temperature just right for cooking egg dishes and delicate sauces by a timed blast of HOT and then a cooling down period of NOT HOT. I despair of cooking dishes that need low, even heat. The stove simply will not allow such a thing. Even soups are treated to this averaging out of HOT and NOT HOT, which means the soup that I’d like to set on the back of the stove to simmer all afternoon, cools down to not cooking at all, and then, with a surge of the stove’s energy, gets its pot bottom scorched. The other day I was upstairs when I smelled the chicken soup. By the time the smell wafts up to me, whatever is on the stove is overcooked. I rushed downstairs and found Howie in the kitchen with his camera. 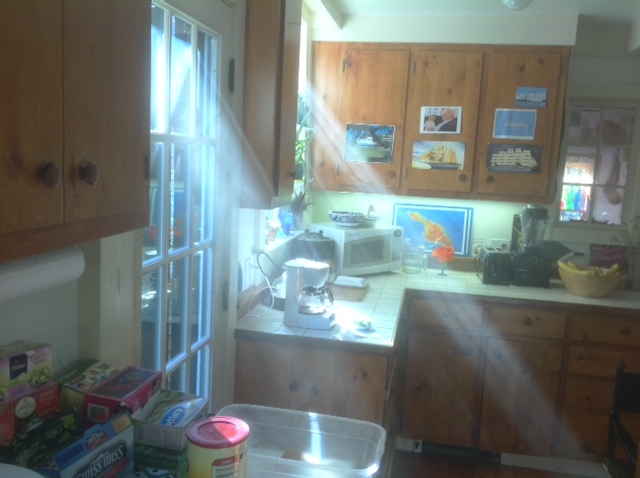 He had turned off the stove, moved the burnt pot to the stone step outside the east door, and was taking stunning photos of a sun ray beaming through the thick smoke. On to the dishwasher, a device I’d like to use to clean those scorched soup pots and egg pans. First of all, it takes more time for it to wash dishes than for me to wash them. I yield to the dishwasher only because I don’t want to take any time at all to wash dishes myself. “I’m going to sit by it throughout its washing cycle just to hear what it’s doing,” I said. I had letters to write, bills to pay. Periodically, I perked up when the dishwasher groaned and sighed, then burbled and coughed, was silent, then started sloshing around. After a half hour, Howie came by to check. At one point the dishwasher stopped working entirely, and along the string of alleged choices on its front, a series of cryptic flashes alerted me to something. I couldn’t tell what. “Do you have the manual?” he asked. “Of course not.” I stacked the envelopes with the paid bills into a pile off to one side. “I’m calling Jason,” I said. “Jason understands how to talk to appliances. When Jason arrived he told me, “When it flashes one long, three short, two longs, pauses, and then five shorts, that means. . .” his voice trailed off, because he could see I wasn’t on the same wave length he shared with the dishwasher. Jason shrugged. “Could be,” he said. 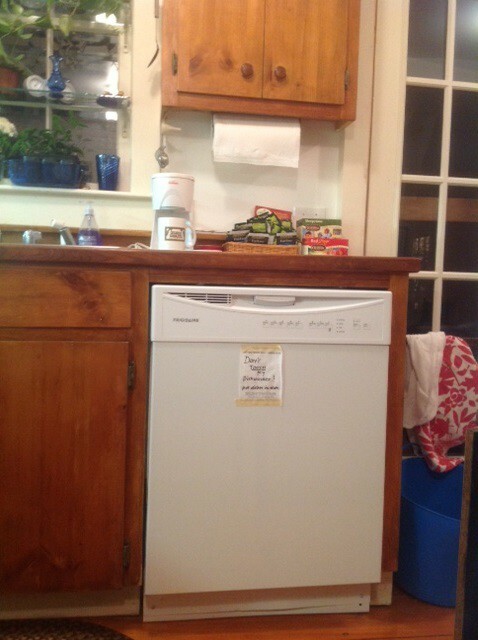 While he was communing with the dishwasher, I asked him to take a look at the clothes dryer. It and I have a pretty good working relationship, but it had stopped putting out heat. Incidentally, when he pulled the dryer away from the wall, he uncovered two pillowcases, a wool athletic sock, bikini underpants, and a towel, which the dryer had mischievously hidden. 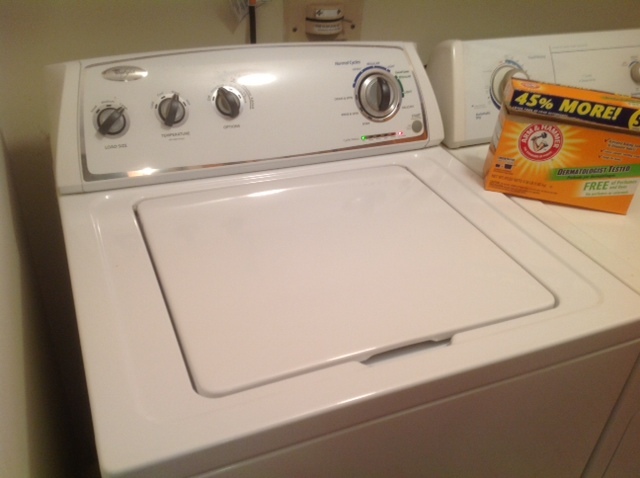 I already mentioned the laundry machine, and how it shifts my dirty laundry in a way that’s comfortable to it. “Have you tried putting the heavier objects at the bottom?” asked Howie. “Why don’t you put in a load and we’ll see what happens,” said Howie. Like the dishwasher, the laundry machine takes forever. That’s what Howie calls “energy efficiency.” We were sitting at lunch watching chickadees at the feeder when I heard that dreaded “Thump! Thump! Thump!” and the machine shuddered to a stop. It’s not easy to open the lid to adjust the laundry. You have to press a certain button for three seconds, a red light goes on, and when it goes off, you can lift the lid. But when I press another button to start up the machine, it starts back at the beginning. “So I have to take out all these heavy soaking wet towels, and where do I put them?” I grumbled at Howie. “Let’s wring them out,” he suggested. He started to help, but I grumbled some more at him, and he backed off. I finished wringing them out, and started all over. I thought perhaps the machine might prefer a lighter load, but that was worse. It won’t accept any load that includes only one or two towels. “Wait until you have a half dozen towels, and put more in each load,” Howie said. But in the end, the machine won. It laundered the extra-heavy load to a fare-thee-well. The stove got back at me, too, the other day. We were fixing lunch on its top. Each day around lunchtime Howie brings out a container of sliced cheese and sliced turkey, and we set about making our own sandwiches. “Here’s the Provolone,” said Howie, tossing the plastic-wrapped cheese to me. Now, neither of us noticed the red light was on, meaning the nice glass top was still hot from previous use. “Thanks,” I said, and picked up the package along with strings of molten plastic mixed with melted cheese. As I said at the beginning, the top is the only part of the stove I like. Once the glass top cooled and the molten plastic and cheese had hardened into an impenetrable coating, I took my single-edged razor blade and gave the stove top a close shave. Don’t get me started on computers.